A burly character star, discovered for films as a teenager by Sergei Nolbandov who cast him in Ealing's Yugoslav-set drama Undercover (1943). 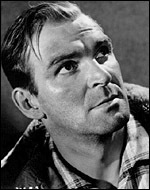 Before his next film, All Over The Town in 1949, he worked with Birmingham Rep and did Army service (1946-48). After small film roles, he made his mark as the bullying Bennett in The Cruel Sea (d. Charles Frend, 1952), when the dangerous edge to his working-class he-man persona emerged powerfully. Busy throughout the rest of the 50s and 60s, he never played conventional leading men - there was always too much sense of threat about him for that - but he created some memorable villains and a few tough heroes in films such as Knights of the Round Table (d. Richard Thorpe, 1953, as Mordred), The Good Die Young (d. Lewis Gilbert, 1954, as a broken-down boxer tempted into crime), Hell Drivers (d. Cy Endfield, 1957, as an ex-con lured into lorry-driving competitiveness), and Joseph Losey 's Blind Date (1959, as a policeman with a bad cold).